Vegetarian Cookster: An (almost) animal-free birthday! My early birthday celebration with my immediate fam Saturday was great. 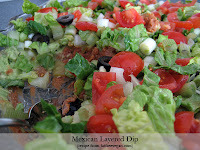 My awesome mom made a Mexican-themed dinner that included this recipe for a vegan Mexican Layered Dip as a starter. It was delicious, everyone loved it. In addition, my mom prepared this recipe for a vegan Mexican Lasagna, which also was a hit... but I think that's mainly cuz my mom cooked up a bowl of ground beef for the omnis to top their lasagna with. :( I was saddened by this, especially since I've been reading The China Study with great interest. I don't want to dictate what others eat by any means... they can choose to eat whatever, just as I can. But, the information contained in The China Study is fascinating. I wish my fam could've went that one meal without animal products and just enjoyed the plant-based food. I'll have to blog more about The China Study once I finish the book. My favorite part of the birthday meal was the cake! As I mentioned previously, I chose to make my own animal-free cake for the occasion. I should mention, not only was this the first vegan cake I've made... it's the first cake ever that I've made completely from scratch! And now that I've done it, I can't imagine ever making a pre-packaged mix out of a box again. 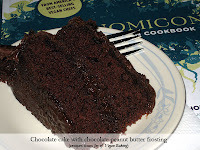 I chose to make the chocolate cake with chocolate peanut butter frosting; both recipes can be found in The Joy of Vegan Baking. The cake itself turned out awesome... but I need some work on frosting-making, LOL. I broke the golden rule... a rule I know by heart, but in my haste, I ignored it and it cost me dearly. Always, always add additional liquid to a mix in small quantities because you can always add more, yet once there is too much liquid in the mix, it's not as easy to fix. At least not for me. And, while making the frosting, I added in too much additional liquid too soon and ended up with a very soft frosting, closer to a glaze. In the end, it all tasted the same... and it tasted DEVINE in my opinion! But, I affectionately dubbed my first cake from scratch "the ugly cake" because it didn't look as pretty as it would have had I made the frosting correctly. happy early birthday! 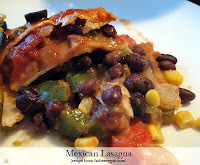 that casserole looks soooo good, i must make that soon - i love mexican food! i know what you mean about seeing family members eat meat..i worry a lot about my bf who lives on pepperoni pizza pops and things like that...ew. Haha I wonder if Molly and Henry would like hummus... they probably would, as they pretty much will eat anything (except raw onions and lettuce). That cake looks brilliant, so no more about it looking bad please! I would have a slice, quick-sharpish! Oh my oh my - what a spread! I remember going to a local football game while I was reading "The China Study" and "Eat to Live," and being amazed at the snacks offered at the concessions stand - namely chili and processed cheese covered fries (or chips), hot dogs, hamburgers, candy and soda. Eaten once in a blue moon, that stuff isn't going to kill you, but since most Americans eat that junk everyday - holy toledo! Just a heart attack waiting to happen! Whether you're an omni or a veggie - it sure pays to eat right. That said, I want some ugly cake! 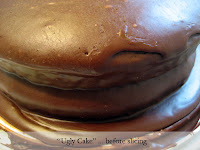 Ugly Cake - ha ha ha! It actually doesn't look bad, and as long as it was edible it counts as a success. I'm not a big cake eater, but I agree that boxed mixes are just foul compared to a cake made from scratch. The rest of your birthday meal looks heavenly! Happy Birthday!!! :-) Sounds like a great way to celebrate. Definitely know what you're feeling about the meat being added. At our holiday dinners lately, at the end of the meal my family keeps saying stuff like "we didn't even need to fix that ham/turkey/whatever".... well then don't!! Maybe someday soon. Your chocolate cake looks yummy!! I made that cake about a week ago and loved it. You can always add more powdered sugar to frosting if it is too soft. just might need to adjust the non dairy butter/shortening. I am also the only vegetarian in my family and it is tough going sometimes. Hopefully they will realize veggie food is so good one doesn't need to add meat! wow, look at that spread! Hapy Belated B'day to you girl! I just found your fun blog. What took me so long! It's fun reading through your old posts. I like that you have an "omni test", because I have an omni boyfriend too. Sometimes I wish he'd be vegan with me, but I also like that he keeps me honest. When he says something tastes good, and I know that he's recently eaten the "non-vegan" variety, then I KNOW it's good. Good score on the bday gifts. When I first became vegan, my family was a bit nervous about it. Especially for the purposes of family gatherings and celebrations. But I have always just perservered with a cheery attitude, and just as importantly, LOTS of good food! I do a lot of cooking, always bring amazing vegan desserts, and have slowly wooed them through their taste buds. As much as you can, volunteer to cook dessert for all the bday parties and such, it's the best way to slowly get people to warm up to the whole concept of being vegan. And then at big holidays like Christmas and New Years, I always make a really good, special vegan dish - and I make enough for everyone! Over the years (7 or 8 now?) my family is totally cool with the whole idea of being vegan. In fact, my two aunts, my cousin and her husband have all become vegans!!! YEAH! We still have turkey at Thanksgiving and Christmas, but every other dish on the table is vegan, and our other holidays are pretty much all vegan.The only exception is my stubborn brother (whom I love! ), so my mom usually makes a meaty and non-meaty dish for his bday. Anyhow, I didn't mean to bore you with such a long post ... but just meant to tell you to keep your spirits up! Sometime soon you'll have a meat-free bday party and your whole family will leave full and happy with their meal!